Eggs are an awesome food! They're incredibly nutritious, tasty, versatile and even the best organic, free-range eggs are relatively inexpensive. Scrambled eggs are often my go-to for a quick breakfast and I usually have a few boiled eggs in the fridge, ready to shell and make into a salad for lunch. I've never been one who loves spending hours in the kitchen. Controversial considering I'm a nutritionist, I know! But recently I've been making an effort to be a bit more creative and find some new recipes to try out. For me, recipes need to be fairly speedy to make, healthy, tasty and not require loads of random ingredients. Here are three of my new favourite egg recipes that fit all of the above criteria. These are like single-portion fritattas. Try making them for Sunday brunch and then keeping them in the fridge for week day breakfasts or work lunches. How to make them: Whisk up 8-10 eggs in a bowl and season with salt and pepper. Pour into a muffin tray, filling each cup around 2/3 full. I use a silicone muffin tray to avoid sticking but if you're not using silicone trays, grease with a little olive oil first. Then add your filling and bake in the oven at 200c (180c for a fan oven) for around 15 minutes, or until cooked through. Leftovers lurking in your fridge! Not as complicated to make as the name would suggest! Shakshuka is basically eggs poached in tomato sauce. How to make it: Finely chop a red onion and fry in olive oil, in a frying pan on a low heat. Add in some tinned toms and a sprinkle of smoked paprika. Once the sauce is thick enough, make two holes in which to poach your eggs. If necessary, coat the area with a little olive oil before cracking the eggs in. 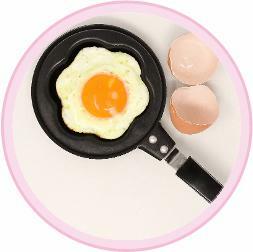 You can finish it off by popping it under the grill for a couple of minutes to cook the top of the eggs if necessary. I'm often told that I eat weird foods for breakfast. We've been brought up to reach for sweet cereals and toasts first thing in the morning but after travelling to Asia a few times,where miso soup, dumplings and noodles in broth often feature at breakfast, I realised that there's no reason not to mix things up a bit! One of my current breakfast favourites is a scrambled egg salad. How to make it: I use mild rocket, halved cherry tomatoes and half a chopped avocado. I dress it with basil oil and top with scrambled eggs. Scrambling is quicker than boiling and peeling but of course, you can swap the scrambled eggs for boiled or poached eggs if you prefer. If salad at breakfast doesn't work for you, this is also perfect for lunch.